Just like your car or plumbing system, it is important to perform regular maintenance on your outdoor lighting system to ensure the whole setup works properly when you need it the most. You see, an outdoor lighting system is an investment in the safety, security, style, and quality of your entire house. You can feel more secure by deterring criminals, enhance the appearance of your yard, or simply walk a little more confidently in the early morning hours to the car. Of course, none of that is possible unless you perform proper maintenance on the whole system. If it has been more than six months since you last had maintenance or service performed on your outdoor lighting system, it is time to put in the effort. You should have the entire system checked by a professional at least twice per year to ensure each light and all of the wiring are functioning as intended. If you fail to perform adequate maintenance, your timers may fall out of sync or bulbs may become burnt out. This increases the risk of slip and fall accidents or a home burglary from taking place. A lack of lighting is a significant risk to your entire home. You know it is time for proper maintenance if you begin to notice lights that are burnt out, lamps that have been uprooted, the lighting system turning on at the wrong time of the day, or entire strings of lights failing to operate at all. These problems should be addressed as soon as possible. Bring in a professional who understands outdoor lighting systems to solve whatever issues and set up a maintenance schedule. 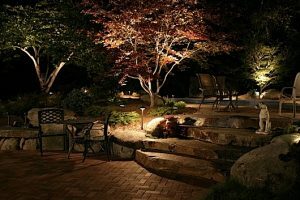 If you require the care and effort of an outdoor lighting system professional, give Blooms Landcare a call today at (817) 688-5352. Your Fort Worth home should be safe and secure with fresh lighting!